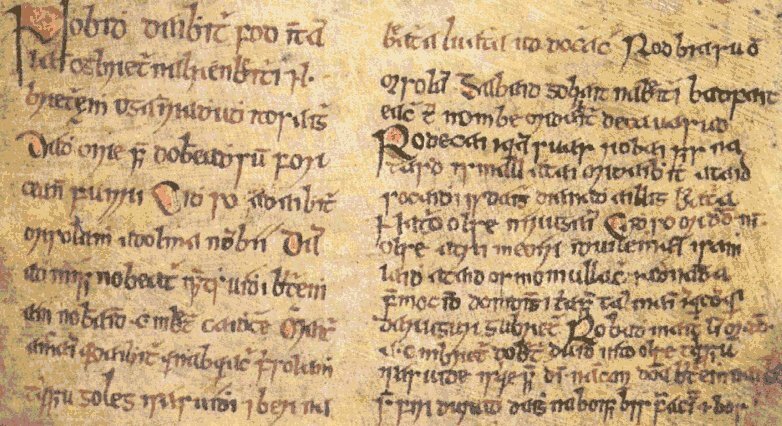 The Treaty of Windsor, 1175, between Henry II of England and Rory O'Conor, High King of Ireland. The Treaty of Windsor, 1175, between Henry II and Rory O'Conor, High King. The King of England has granted to Roderic [Rory], his liegeman, king of Connaught, as long as he shall faithfully serve him, that he shall be king under him, ready to his service, as his man. And he shall hold his land as fully and as peracefully as he held it before the lord king entered Ireland, rendering him tribute. And that he shall have all the rest of the land and its inhabitants under him and shall bring them to account [justiciet eos], so that they shall pay their full tribute to the king of England through him, and so that they shall maintain their rights. And those who are now in possession of their lands and rights shall hold them in peace as long as they remain in the fealty of the king of England, and continue to pay him faithfully and fully his tribute and the other rights which they owe him, by the hand of the king of Connaught, saving in all things the right and honour of the king od England and of Roderic. And if any of them shall be rebels to the king of England and to Roderic and shall refuse to pay the tribute and other rights of the king of England by his hand, and shall withdraw from the fealty of the king of England, he Roderic shall judge them and remove them. And if he cannot answer for them by himself, the constable of the king of England in that land [Ireland] shall, when called upon him, aid him to do what is necessary. And for his agreement the said king of Connaught shall render to the king of England tribute every year, namely, out of every ten animals slaughtered, one hide, acceptable to the merchants both in his land and as in the rest; save that he shall not meddle with those lands which the lord king has retained in his lordship and in the lordship of his barons; that is to say, Dublin with all its appurtenances, that is to say, the whole of Leinster; and Waterford with its whole territory from Waterford to Dungarvan, including Dungarvan with all its appurtenances. And if the Irish who have fled wish to return to the land of the barons of the king od England they may do so in peace, paying the said tribute as others pay it, or doing to the English the services which they were wont to do for their lands, which shall be decided by the judgment and will of their lords. And if any of them are unwilling to return and their lords have called upon the king of Connaught, he shall compel them to return to their land, so that they may there in peace. And the king of Connaught shall accept hostages from all who the lord king of England has committed to him, and he shall himself give hostages at the will of the king. The witnesses are Robert, bishop of Winchester; Geoffrey, bishop of Ely; Laurence, archbishop of Dublin; Geoffrey, Nicholas and Roger, the king's chaplains; William , Earl of Essex; Richard de Luci; Geoffrey de Purtico, and Reginald de Courtenea.